Going into this, you'd figure this would be redemption night for the Toronto Raptors after losing a heartbreaker to the Charlotte Bobcats. It wasn't the case on Friday night. In what seems to be typical fashion, the Toronto Raptors failed to capitalize against a Detroit Pistons team that to be honest, aren't that great. 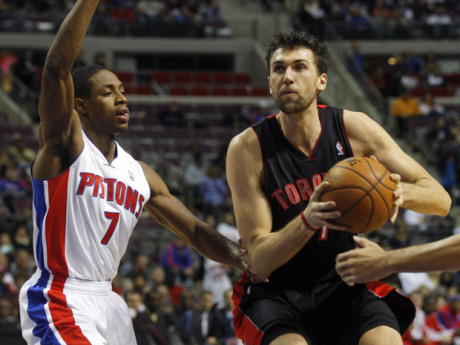 Andrea Bargnani started off the Raptors on the right note, scoring 17 of his 34 points in the first quarter alone. Il Mago stepped up big time, and took on the offensive load on a night where DeMar failed to show up. Well, this was an ugly first half for the Raptors guards where Lowry-DeRozan-Calderon did not get anything done offensively in the first half. There was a long stretch late into the second quarter where all of the offence came from the bigs and the backcourt were held scoreless. Kyle Lowry redeemed himself in the second half, sparking a run that brought the Raptors back into this one (yes, the Raptors fell behind in the third quarter). Now, as much as Lowry brought Toronto back in this game, Lowry resorted to putting his team on his back and decided to take the final shot in the game....I'm just not sure if a 20-foot jumper was the best decision. But hey, this is what you brought him in for....to try and win games. These were limited minutes but Ed Davis put in work. This was definitely a strong"Pound the Rock" performance and exactly what Coach Casey would want to see from Ed Davis, who put in a strong effort on both ends of the floor. Big shoutouts to the rook for his first career double double. Definitely a raw, 19 year-old big man that has the potential to be beast in the league. If he develops his skill sets over the next couple of seasons, we're looking at dominating forward/centre in the years to come. Free throws are terrible, but hey, he's still young.